Full steam ahead aboard the Empire Builder | Where's my backpack? 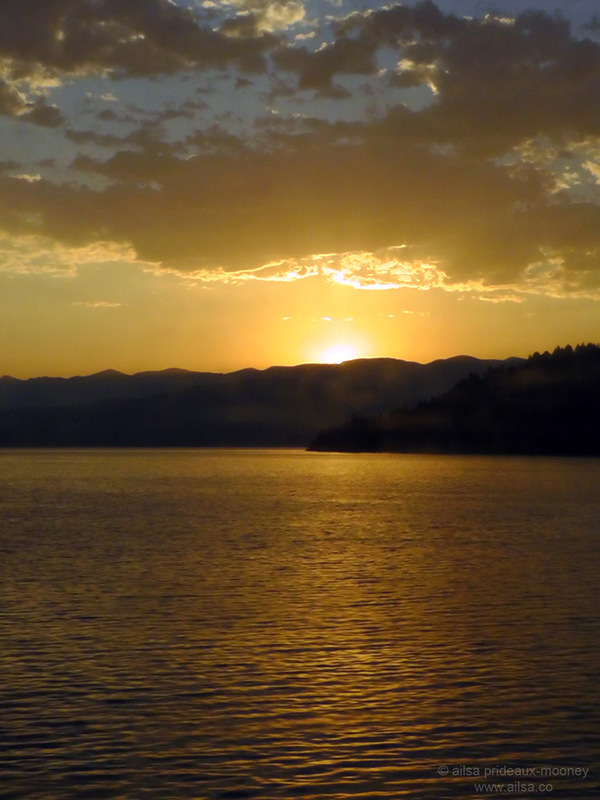 I woke before dawn on my third day aboard the Empire Builder. The observation car was silent and the passing countryside soaked in darkness, but then the first grey light of pre-dawn began to outline the contours of mountains and a glimmer of river. All too soon, the ethereal half-light gave way to an angry burst of fiery red clouds and then golden daylight hit the river water and filled the observation car with dancing shafts of light. Change was in the air. In Spokane, a new crew boarded and cars were decoupled. Half the train was going to Portland and the other half to Seattle. I said goodbye to my Amish friends as they headed off down the tracks in the observation car bound for Portland. Our part of the train got the dining car, so I wandered down for a strong cup of coffee and a plate of eggs with some fellow passengers I had met at an earlier meal. We greeted each other like old friends and swapped stories. They were well-rested, having had the luxury of a sleeper car, but sequestered in their private quarters they had missed out on all the excitement of the near mutiny and were still in the dark about the previous day’s mysterious delay. My tiredness slipped away as I filled them in on the adventures they had slept through, and suddenly my spot in the observation car seemed infinitely preferable to a comfy bed in a private car. Back in my seat, I overheard a fellow passenger ask a conductor if we were on time. The conductor who had boarded in Spokane laughed amiably and answered ‘I can’t speak for what went before, but my part of the journey is on schedule. We’re not going to lose any extra time on my watch’. The whole car erupted in laughter. It was reassuring to see most people had maintained a sense of humour. A glance out the window revealed the countryside was changing rapidly now. 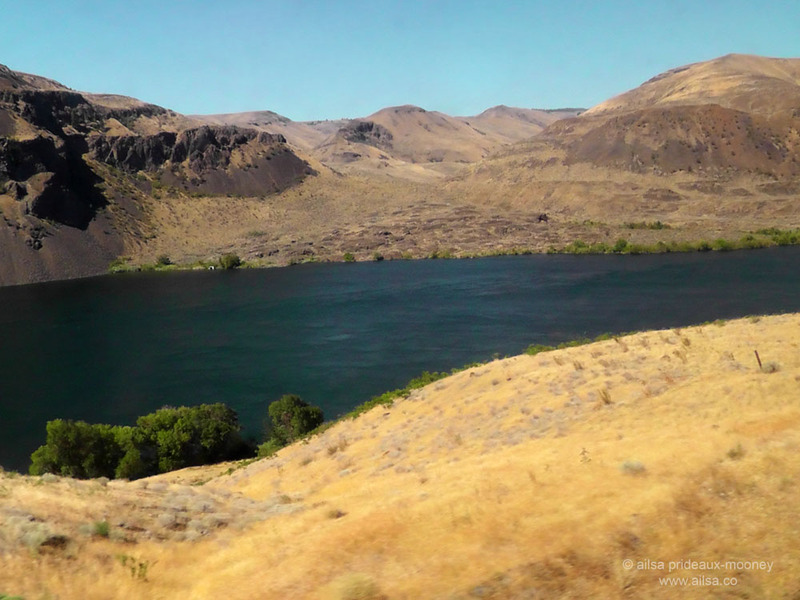 We were passing through the fertile lands of the Columbia Basin. The scars of agriculture formed vast swathes of colour, geometric and sweeping and dramatic enough to rival the most modern of painters. 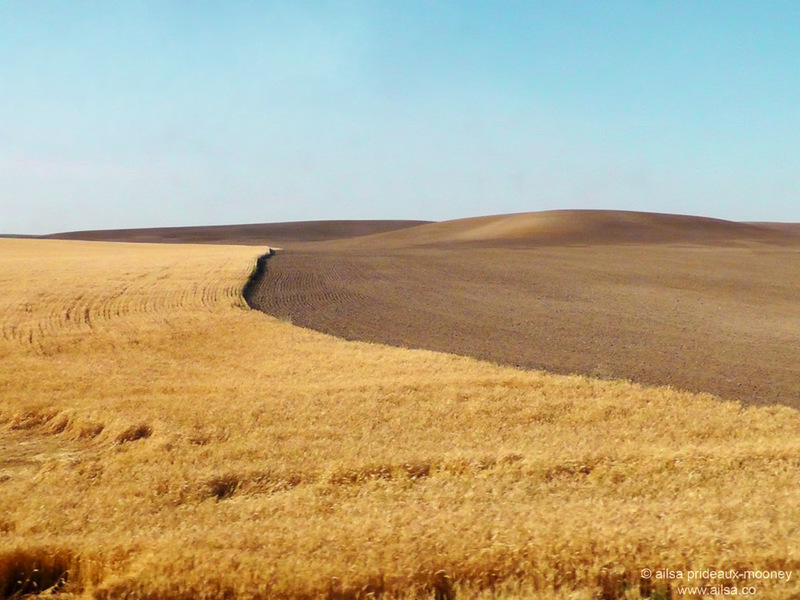 The sharply etched fields gave way to high desert. I was in familiar territory now, having driven the stretch from Spokane to Seattle countless times in the past. 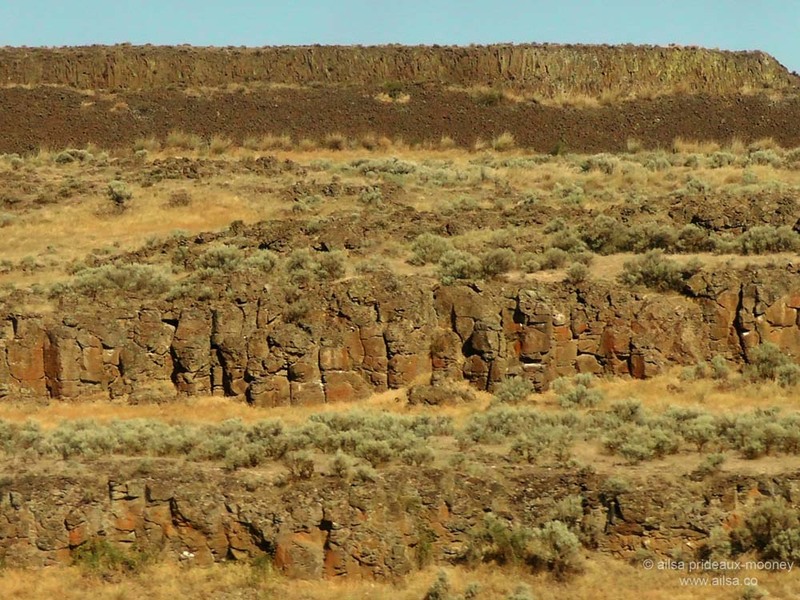 Huge, parched, craggy outcrops lined the tracks, dipping down to afford tantalizing glimpses of the Columbia River beyond, twisting and weaving its way through the arid landscape, appearing at alternating sides of the train as it clattered across bridges. The tracks cut stark gashes through the barren landscape. 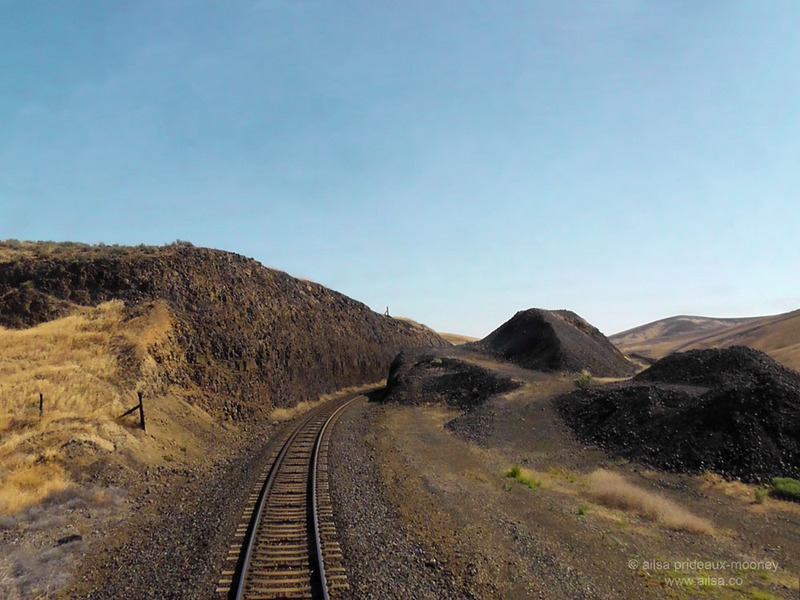 I discovered, to my delight, that the decoupling in Spokane had left the back window of the train in full view, so I could watch the tracks unfolding behind us as we carved our way through eastern Washington. 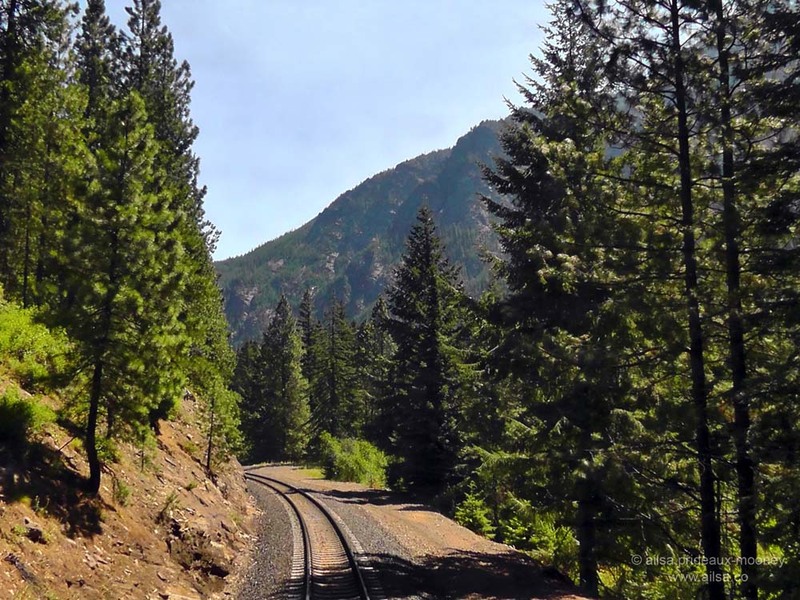 Then green trees and waterfalls, green rivers and the Cascade Mountain Range were suddenly flanking the tracks on both sides. As we crested Stevens Pass, the train plunged headlong into the Cascade Tunnel. It is the longest tunnel in the US; a masterpiece of man’s perseverance measuring 7.8 miles in length. After a full quarter hour of darkness we re-emerged into dappled green and dropped down into the overcast lushness of western Washington. As we descended, the Cascades soared like giants behind us, and then we hit coastline. This was it, the final stretch of the journey along the coast from Everett to Seattle. 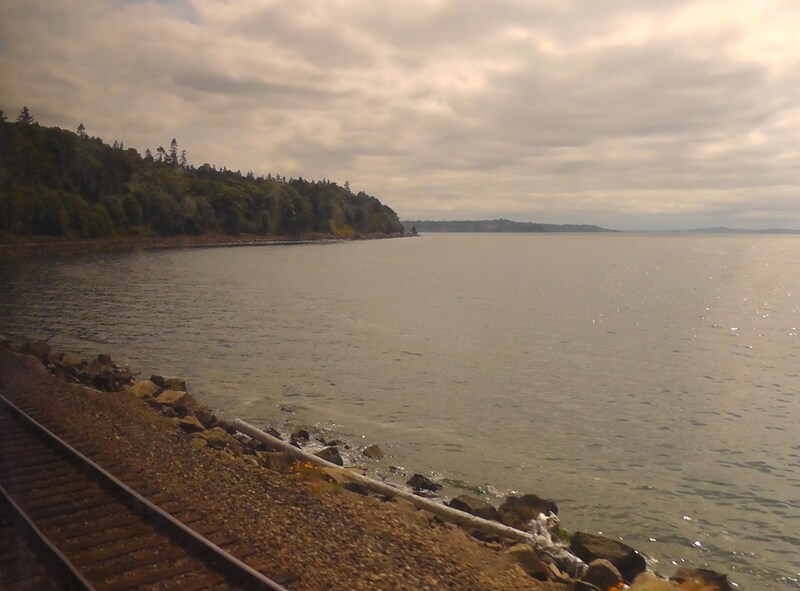 Cloud-blanketed skies diffused gentle light across Puget Sound as the Empire Builder clickety-clacked along its final few miles of track. This entry was posted in Photography, Travel, United States and tagged photography, photos, pictures, postaday, travel, writing. Bookmark the permalink. Wow … so awesome! I feel like I was there with you! SCHWEET word and photo essay!!! Wow thank you for taking me with you on your journey. Waiting for the trip back! Beautiful potos they explain everything. I had never seen Eastern Washington before. It was quite a treat to see it in your photos, and the way you describe it is perfect: as geometric, sweeping and dramatic as a modern painting. Wonderful photo essay. ah yes, these are familiar scenes, but I’ve never gotten to take any photos from a train. That’s on our list! I have so enjoyed the trip alongside you – hope the return by car is wonderful! Wonderful images! I have never been but I love a great rail ride too! This was definitely my favourite part of the journey, Denise. Montana and Washington are incredibly scenic states, and I am always thrilled by the huge contrast in landscape and climate when you traverse the Cascades. Beautiful photos that capture the country. Did you grow up on Washington? The first time I came to the Northwest, i knew it was going to be my home. I hope you have fun in Seattle–so much to do. Artifacts from the tomb of King Tut are on exhibit at the Science Center, if you like history and museums, and we have two national parks and a volcano that really works within driving distance. Hi Naomi, I grew up in Ireland, but have spent time in Washington state before and love it dearly. I noticed they have a really fun sign over King Street station where they’ve inserted a ‘Tut’ between King and Street. Made me laugh. Even though I’ve spent time here before, I’ve never visited either of the national parks, so am definitely going to see them while I’m here. If you can possibly get to Olympic National Park, it is only 17 miles out of Port Angeles to Hurricane Ridge. There is a stunning view, and if you follow the road a little past the visitors’ center, you will come to the trail head for a spectacular day hike on Hurricane Hill. It is my favorite hike in the Northwest. Thanks for taking me along on the journey. Lovely images despite the dodgy chances shooting from a train! Wonderful journey I’m able to do with you here … you’re a such a good story teller too. It’s like I’m there with you. 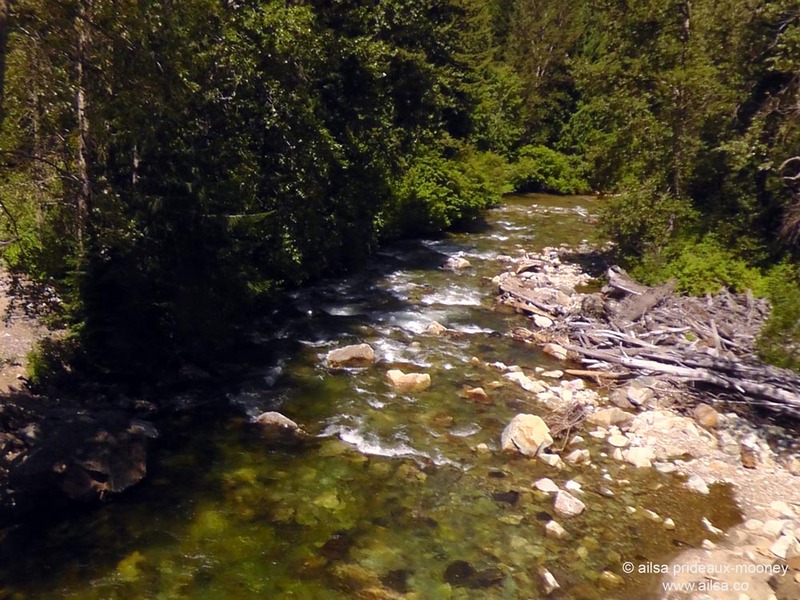 The photos are fantastic for being taken from a moving train – when I traveled on the train from King Street to Vancouver only 4 hours it was so foggy I could only get 3 pictures – it was yearly in the morning .. and they didn’t turn out that great. That’s life. Thank you so much … for this journey. I was also lucky when I took photos from our bridge between Copenhagen and Malmoe – took 4 and they all came out good. That train moves fast too and with the bridge’s all construction in the way. This with memory cards are fantastic – just to delete all the not so great shots. Your shots are stunning and your story telling is brilliant. Blush, thanks for the compliments, viveka. I totally agree, the digital age has made it so much easier (and cheaper) to take surplus shots in the hope that at least one of them will be a keeper. It would be horrifically expensive with film! I have my wonderful Canon, the film eating one, on the topshelve in the wardrob – out of all the photos I taken with it maybe 100 has been perfect in my eye – so I’m concidering buying a bigger, but then my great lenses doesn’t fit of course. Catch 22. Such a wonderful journey to take from the comfort of my chair at home. 🙂 Thanks so much much for sharing your amazing photos, Ailsa. I really love your dawn pics. Great series on your train trip! Feel as if I was there with you enjoying the views and experiences! You make me want to take a train across the country (even though I know I’d hate it. No showers? No, thank you!). 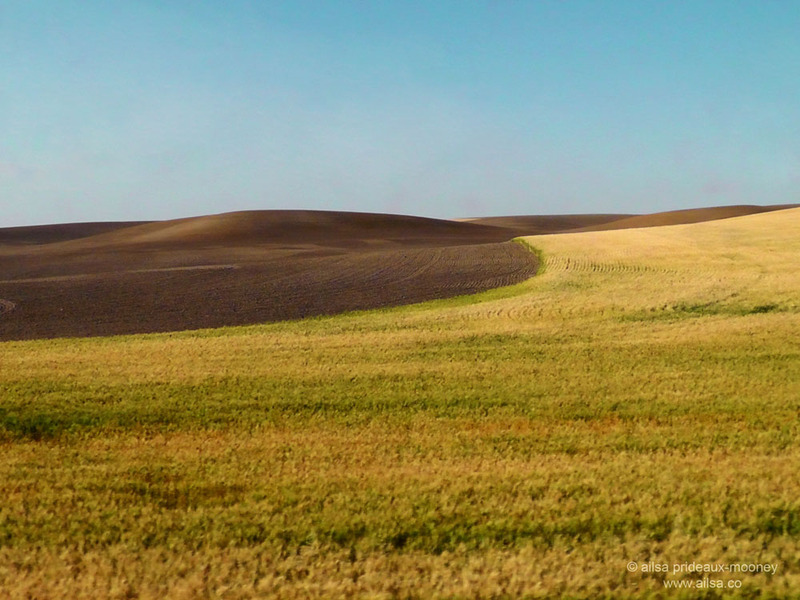 The Eastern Washington pics make me miss home. I’m glad you made it to Seattle safely, and I hope you enjoy the return trip! A great plan! A friend of mine suggested waiting until people left for meals and sneaking into the shower, but that didn’t sound like a wise plan! Audible sigh as that oh so familiar desert land turned into green forest on this side of Stevens. I love my state! I always wanted to travel on one of these trains, and I want to even more now! You really should, Jo, it’s quite an experience. I hear some of the west coast routes are really wonderful. NICE.. then you DO know spokane.. Wow.. I don’t think I’ve ever caught a train before 3 am. At any rate your Empire Posts inspired me to re-visit my idea of Amtraking it to Chicago in January. The photos are great and made me a little homesick. Wonderful! This makes me want to take a long vacation train ride even more now! If only I could get my husband to leave the cigarettes at home! Haha, Sue, tell your hubby to bring nicotine gum just in case! Amazing love the contrasting landscapes, those sweeping fields are lovely. Oh, Emily, I feel your pain, it’s hard living that far away from the ocean. I hate feeling land-locked – growing up in Ireland there was always ocean somewhere nearby. I like your writing about “Full steam ahead aboard the Empire Builder.” Do you have a photo of the train that you rode? What beautiful places-I really wanted to close my eyes and just :be there: forma while in each one, I will definitely follow m]this blog and hope to participate. I don’t get to got to exotic places very often but there are many beautiful ;”sites” right here where I live. I hope that those of you who participate in “Where’s my backpack” will check out my entries as well. HI Beebee, so glad you like my blog, very happy to meet you, and look forward to sharing stories in the future! What great fun on the trains! That is my preferred way of traveling and is a great way to see this beautiful country. I love the Empire Builder route and have traveled on it several times. I’ve been shore to shore like you to NYC and Seattle via the train. Great posts! What a dream! I’ve got friends in Seattle and as soon as I can afford it, I’ll be on the Amtrak. Your photos evoke the wide open, pure and longing spaces the west evokes in my memories. 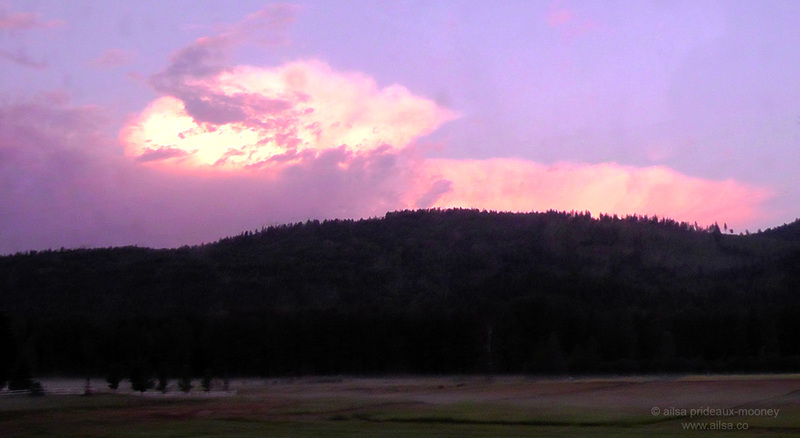 There’s nothing like sitting on the dining car, meeting new people and soaking up the glory that is the west.